On Thursday 16 November, Germinate: The Arthur Rank Centre received the bronze award in the Best Rural Project category at the Christian Funders’ Forum Awards at Methodist Central Hall, Westminster. We fought off stiff competition at the annual awards which celebrates the great work done by grassroots organisations across the UK. ‘So much of the incredible work that goes on in our communities is largely unseen and mostly unrecognised. 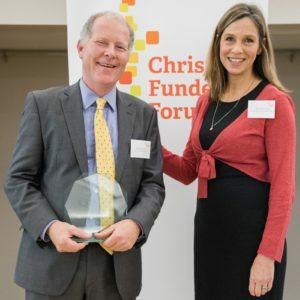 The Christian Funders’ Forum Awards are about putting the spotlight on the work of churches and charities whose volunteers live lives in the service of other people,’ says Matt Bird, Chair of Christian Funders’ Forum. Each year members of the Christian Funders Forum (CFF) give over £30million a year to Christian mission both in the UK and overseas. Some of the most innovative projects funded by the member organisations over the past year were recognised at the awards ceremony in London on 16 November.